Tonight I am going to a dinner party, and I was asked to bring a pumpkin dessert. That is how this pumpkin chocolate mousse pie came about. It’s got a chocolate pecan crust, a rich pumpkin mousse for the filling, and a chocolate drizzle on top. So yum!! You can tell by the picture that I may have gone a little crazy with the chocolate. I’m sure the guests won’t complain! This healthy pie may look fancy, but it’s super simple to whip up! There is actually no baking required. You can make it ahead of time and pull it out when you are ready to eat. It happens to be vegan, gluten free AND paleo approved! This pie would be a great dessert for Thanksgiving as well. 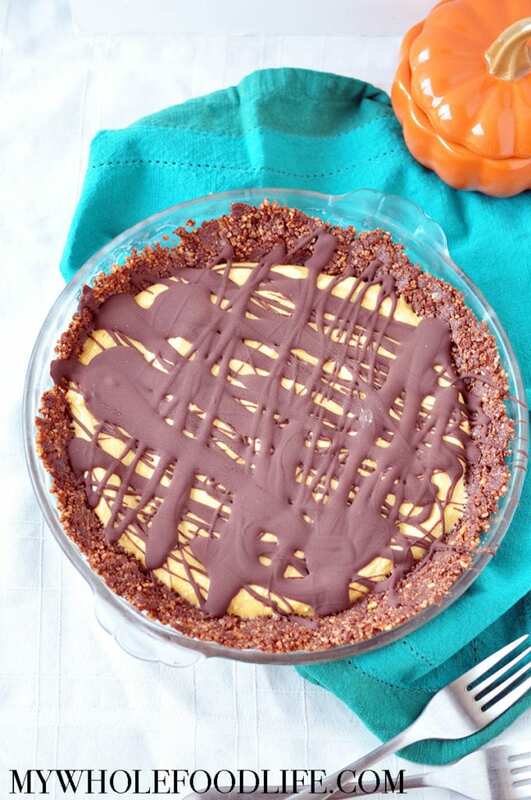 It’s a great alternative to traditional pumpkin pie and great for chocolate lovers! Since there is no baking required, making this leaves the oven free to cook all those yummy Thanksgiving eats. I hope you enjoy it! A healthy and easy pie that is sure to please! No baking required. Vegan, gluten free and paleo. In a food processor , combine the pecans and dates. Blend until you start to get a coarse consistency. Then add the coconut oil and pulse a few more times. Press the mixture into a greased pie dish and place int he fridge while you make the mousse. Open the chilled can of coconut milk and scoop out the white fatty part into a bowl. You can save the remaining water for smoothies. Use a whipping attachment on your mixer to whip into a cream. Then add the pumpkin puree, maple syrup and cinnamon and whip some more. Spoon the mixture into the pie shell and place back in the fridge while you melt the chocolate. Use a double boiler method to melt the chocolate and coconut oil together. Once melted, drizzle over the top of the pie and place it back in the fridge until you are ready to serve. This pie should last in the fridge for at least a week. Enjoy!! I would really like to try this but I have a bad allergy to walnuts and pecans. Is there a different crust you would recommend? I am not paleo and would not mind if a crust needed to be cooked. Just have lots of food allergies. Thanks for all you do! Could I use Tahini in place of Coconut Oil? Also can I use a nut milk in place of Coconut milk? Thank you. Tahini may work, but I am not 100% sure. Almond milk cannot work in place of coconut milk because it doesn't have the fat profile needed to make a mousse. How did I miss this recipe? Def putting this on the "to make" list. Thanks for the amazing recipes. Have your 1st cookbook and about to order your 2nd one. I made this today and it was great! Super easy. I just added the cacao to the processor with the ingredients as I didn't see when to put it in, but it was fine. I used 3 tbsp maple syrup, but next time I'll use 4. I always forget that when things go from room temp to cold they lose some of their sweetness. So 4 would have had more sweetness. Thank you for another yummy recipe! Awesome! I used a smaller pie pan, next time a 9" would be better, thinner crust & doubled the mousse to fill up better...just had extra mousse (darn had to sample)! But wonderful & a do over. Hubby liked and he "doesn't like that gluten free stuff"
Can't do any type of nuts. What would be a great replacement for the crust? I'm thinking this was supposed to used coconut CREAM and not milk? I just made it and it is too liquidy.